Francois Pignon (Daniel Auteuil), the hero of Francis Veber&#146;s The Closet, is too anonymous to be an Everyman&#151;he&#146;s a Nobodyman. He&#146;s been grinding his life away as an accountant at the same rubber-goods factory for 20 years. He lives alone in an apartment that feels more like a waiting room than a home. He&#146;s a creature of habit, wearing the same blue suit every day, and invariably greeting his coworkers each morning by asking them if they&#146;d like some coffee. (They never do.) He&#146;s too bland to be despised, except perhaps by his ex-wife and son, who have cut him out of their lives. Life has passed Francois over&#151;it couldn&#146;t even be troubled to give him a personality. So when Francois overhears that he&#146;s about to be fired, it&#146;s the last straw&#151;he&#146;s ready to kill himself. He&#146;s saved, though, by his neighbor Belone (Michel Aumont), a retired corporate psychologist who knows just how to save Francois&#146; job. Belone plants the rumor at Francois&#146; company that he&#146;s gay, and overnight everyone sees him in a new light. His bosses, not wanting to offend their biggest client pool (condoms are their biggest product), withdraw the termination. 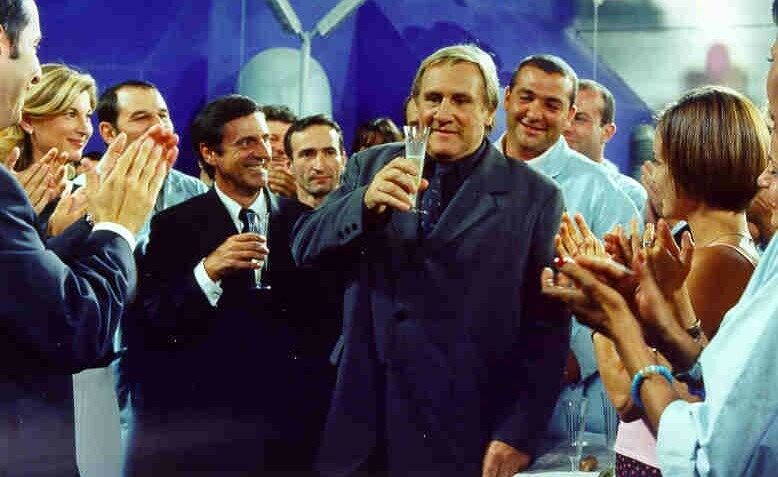 Assuming that his bland exterior must be masking a libertine, Francois&#146; associates begin projecting their own personalities onto him, especially a homophobic coworker (Gerard Depardieu) who grows increasingly obsessed with him. Eventually, even Francois&#146; dismissive family gets scent of the rumor, and is forced to take fresh stock of the husband and father they thought they knew. The one person who sees through the &#147;new&#148; Francois is his comely accounting colleague, Mlle. Bertrand (Michele Laroque), and she&#146;s the one that has a front row seat when Francois finally begins to assert himself. Yet for all of his problems as a director, Veber&#146;s script has a genuine sweetness to it, partly because Francois never changes on the outside. Where most comedies would have forced him to wear progressively campier outfits until he&#146;d finally be going to work in drag, Francois never gives up his blue suit. He remains boringly straight on the surface&#151;that is to say, he stays true to himself&#151;and the story never forces him to &#147;prove&#148; his gayness through nelly shrieks or any other degrading shtick. And there are other unexpected (if small) rewards, such as a line of dialogue about a pink sweater that Depardieu&#146;s character delivers after he&#146;s suffered a nervous breakdown&#151;it&#146;s an inanely touching moment. Daniel Auteuil looks so different from one appearance to the next that it&#146;s fun just trying to connect the guy you&#146;re watching now with the guy you&#146;ve seen in other movies. Here he&#146;s playing a Tony Randall character, but Auteuil has too much self-respect to play him the way that Randall would. His very self-effacingness makes Francois compelling, and such simple actions as hanging up a coat become almost absurdly interesting to watch because his fastidious Francois does everything as a series of steps. Depardieu is almost literally straight-jacketed in his early scenes&#151;his suit looks a couple sizes too small&#151;and ultimately his character doesn&#146;t have enough to do to warrant the casting of a major star. But Michele Laroque is a find, a full-bodied, womanly presence that&#146;s all the more attractive for her maturity. It&#146;s easy to see why Mlle. Bertrand can help chase away Francois&#146; blues.